Wagener resident and businessman Retired Master Sergeant Jimmy Wilson, USAF, has gone to Clinton, TN to spend the week fishing with the pros. Not a bad gig, right? “I’ll probably put 40 hours on my boat just this week, that’s more than most people do in a year.” Wilson told me in an interview last week. “I’m actually pretty pumped about it,” he added. That has to be the best 40-hour work week I’ve ever heard of. And? I think he’s edging for a new boat. 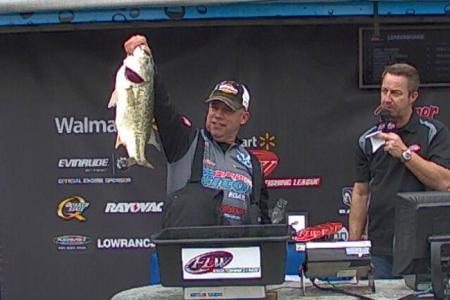 JW: You got Shaw Grigsby, Bryan Thrift (he just won the last tournament). Wesley Strader — he’s been around for years, a good man. We’re all fishing against each other. One on one, Mano a Mano. Jimmy Wilson was born in Cincinnati and raised “all over the United States.” Wilson has three brothers, one of which is deceased, and one sister. His mother is living in Ohio; his father is deceased. Wilson and his wife Susan have 8 grandchildren, all of which have the fishing bug. Find Jimmy Wilson on Twitter and Facebook.